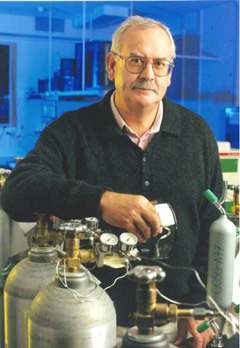 Dr Paul Fraser, BSc (Hons) Chemistry (1969) and PhD Chemistry (1972), spent over seven years at Monash University, from the mid-1960s to the early 1970s - times that would set him up to become one of the world’s most renowned atmospheric chemists. “My time at Monash University was inspirational – you couldn’t help but have a memorable time there, it was so vibrant,” says Dr Fraser. An active alumnus, Dr Fraser has maintained his links with Monash, initially through the Monash Cricket Club and, in later years, by keeping in close contact with other chemistry alumni, through functions and sporting reunions. Surfing at Merimbula around the age of 18, he met his now wife, Jocelyn, whom he married in Melbourne in the first year of his PhD. Many Monash chemistry staff and fellow students attended their wedding. They now have three children - two of whom are also Monash graduates (Engineering and Chemistry) – and four grandchildren. Once graduated from Monash, and after successful post-doctoral appointments at Bristol University and at the ANU, in the area of organometallic chemistry, Dr Fraser decided on a significant change in career direction into climate change research at the CSIRO. Having secured a research scientist position at CSIRO, he has remained there ever since, with important sabbatical appointments at the Universities of Colorado and East Anglia. Dr Fraser dedicated his post-academia career to a topic (anthropogenic climate change) that has, until relatively recently, not attracted the world-wide attention it receives today. However, despite the recent politicisation of his field, he remains delightfully optimistic about the future of planet Earth and believes that “the creative human spirit will overcome the problems thrown up by climate change”. “I believe we will be able to achieve significant future reductions in emissions of greenhouses gases into the atmosphere and that we can provide certainty to industry leaders about what technology to use to achieve this goal and what impacts this will have,” he says. His career has seen him win a multitude of awards, including the prestigious Eureka Prize for Environmental Research (1995), and the US EPA Ozone Protection Award (2002). He gained a CSIRO Lifetime Achievement Award in 2004 and in 2005 he was elected a Fellow of the Australian Academy of Technological Sciences and Engineering. In 2012 the Royal Australian Chemical Institute described Dr Fraser as ‘a living luminary of Australian chemistry’. Dr Fraser’s work has included the establishment of the Cape Grim Atmospheric Baseline Station in Tasmania in the late 1970s. It is the most important station of its type in the Southern Hemisphere. In 1978 he founded the Cape Grim Air Archive, the most important archive of background air in the world. He and his team at CSIRO have discovered several new greenhouse gases in the background atmosphere. Dr Fraser recently donated a sum of money to the Faculty of Science Discovery and Innovation Fund to ensure future science students can continue great work. Dr Fraser plans to remain with CSIRO until he retires (a few years hence), at which point he will commence writing about his family history - tracing the roots of his Scottish forebears who imMGEated to Australia in the 1820s (Jackson) and 1840s (Fraser).